← Foxwoods Joins Forces with Lion Fight Promotions for First-Ever Lion Fight Event on the East Coast: LION FIGHT 15 on Friday, May the 23rd. Staying busy across four decades to promote our sport, Mike Miles showed he’s still at peak performance in ‘NIGHT OF PAIN’. The 10th episode of his Canadian Challenger Muay Thai series sold out Calgary’s Deerfoot Inn and Casino on Saturday April 5, 2014. The event highlighted two very strong professional Canadian athletes. It was sanctioned by the WMC, CCSC, CMTC-A. The Main Event featured Canada’s best kept Muay Thai secret in Hakeem Dawodu. Hakeem’s Muay Thai stock appreciated in Japan with his KO wins over Thailand’s Gunnaper Weerasakreck and Japanese favorite Junpei Hirai. 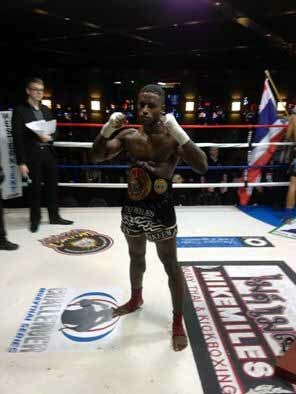 Back on home turf in North America, Dawodu took the battle to a former Ratchadamnern Stadium and Thailand national champion in Sam Samut. At stake was the second most important title in World Muay Thai Council rankings, a WMC Intercontinental Muay Thai Championship. Sam Samut started the bout unsurprisingly slow, as is the custom for most Thai athletes. Dawodu feigned, taunted and scored effectively. He landed some punches and kicks plus an elbow that tattooed an ugly mouse on Sam Samut’s forehead. In round two, the Thai tried more to engage Dawodu, but he couldn’t catch the elusive Canadian. Hakeem maneuvered to again land punches, kicks and knees. While many of the blows made a resounding thud throughout the house, Sam Samut smiled his defiance. If the Thai was concealing any frustration behind these smiles, he vented on the bent of vengeful elbows. Round three saw Sam Samut take the fight to Dawodu, whose moving target remained difficult to hit. As the Thai came into clinch, he walked into the harm’s way of Hakeem’s elbow. It sliced a gash on Samut’s forehead above the left eye. Like blood in the water, their clash turned to frenzy. Dawodu worked the gash, while Sam Samut leaned hard elbows into the clinch. Hakeem was nimble on the counter, dumping the Thai repeatedly to the canvas. Sam Samut came into the fourth round aggressively, kneeing on transition to clinch and elbow. Dawodu was adept at countering the Thai’s attack with the sting of his own elbows. Sam Samut pressed hard throughout the entire round on the assault of long range knees. When Hakeem got sloppy, while throwing a knee, the seasoned Thai did a sweep and toss. Behind on the score cards, Sam Samut went into the final round going for a knockout. Whenever he tried to go inside, though, the Canadian dumped him on the canvas. Seizing the initiative, it was Hakeem Dawodu who then went for the kill. Although he wasn’t able to keep it from the judges, the Canadian punished Sam Samut enough for a comfortable margin of victory. “It was great to see Dawodu pushed the distance. This was a lesson in many ways, and an important lesson for Dawodu. Onward and upward. Dawodu wants to fight anyone, and I say that without arrogance, he wants to improve”, said coach Mike Miles. It’s often been observed that styles make fights. How did this come into play here? MacKinnon was stepping into the ring against Jason Caldwell. The American had just beaten WKA World Champ Charles Bisset. In turn, Bisset had defeated MacKinnon two years ago. The speculation, thus, was that Caldwell would probably beat whoever had lost to someone he’d already beaten. The logic of rankings does not and cannot predict the outcome of mixing new stylistic ingredients. MacKinnon and Caldwell both came out of their corners eager to mix it up. They quickly exchanged shots. Mark realized that he needed to dial it down on the dual imperatives of discipline and control. Whether Jason took this as an invitation to pounce, he walked right into a precisely timed right elbow from the Canadian. MacKinnon’s coach Mike Miles said “The elbow was so fast many did not even see it – including me – because MacKinnon’s back was to me, as the elbow landed. I was surprised the bout was over so quick.” Mark MacKinnon won the bout 20 seconds into the first round by elbow KO. The show originally had ten bouts set to go. Seven bouts were guaranteed. Two days before show time, one fighter pulled out. The day of the weigh-in, three failed medical clearance to fight. This brought it down to six bouts. Then post weigh-in, two gamers were thrown together (voluntarily) to battle and make a seventh bout. This was a good clean fight, with crisp exchanges and both fighters demonstrating sound skills. All three rounds were close. Leier took one round, while Bruns won the other. It was round three that decided the outcome. Phil moved well at first but then suddenly slowed down and fought defensively. This conceded the initiative to Brian, who took full advantage. The bout was close enough for some disagreement among the judges but a plurality voted for the American Brian Bruns by Split Decision. Both these gamers had been scheduled to fight different opponents under different rules. Dwain’s bout was originally supposed to be under modified Muay Thai rules for three rounds. Andrew’s contract was for five rounds of full rules Muay Thai in quest of the vacant Western Canadian Muay Thai Title. Both agreed to meet each other halfway, just to get a match under their belts. The taller Grieve brought a reach advantage that Blake neutralized in the clinch. In dominating the clinch, Weigel dumped Jeremy often throughout the bout. While Grieve also worked in the clinch, he was more passive in trying to tie up Blake, rather than exchange with the local. Both threw punches in bunches, along with kicks and knees, in what proved to be a crowd pleasing match up. The bout was close enough for the judges to split their ballots with Blake Weigel winning the Split Decision. Hayball literally ran across the ring, off first bell, throwing leather. In the first round and most of the second, Olivia connected more effectively with punches, kicks and knees. Maria’s pace was just too torrid, though, and took its toll on Awad. By the third and final round, she was able neither to mount effective offense nor defense. Maria Hayball earned the win by a Split Decision. First match of the evening featured these two rivals for survival. Tony was glad to be back on Canadian soil from Japan, where he’d beaten a native with 50 plus fights. This was his sayonara before turning pro for fame and fortune. Jordan did his job, exchanging leather with Kuhn, but Poirier’s downfall came from moving backwards after punching. This gave Tony the edge to press continually, while moving forward. The bout was action packed and well matched. Tony Kuhn won by Unanimous Decision. This entry was posted in Events and tagged Calgary, Canada, Charles Bisset, featured, Gunnaper Weerasakreck, Hakeem Dawodu, Jason Caldwell, Junpei Hirai, Mark MacKinnon, Mike Miles, Ratchadamnern Stadium, Sam Samut, World Muay Thai Council. Bookmark the permalink.